Travel to the deepest parts of the jungle to witness one of nature’s most unique sights. Click here to play! It’s that of the partying parrots. If you can capture images of these singing birds, you’ll win more than your fair share of cash! First thing you’ll have to do is find the Parrot Hut. Spin this treetop house as much as possible as it is a wild symbol that will replace most others to bring in even more winning combinations. It only appears on selected reels so keep your eyes peeled. Then, you’ll need to get a few snaps of the parrots themselves. These winged crooners will payout handsomely with the red parrot bringing in up to 12500 times your line bet and the blue parrot bringing in up to 5000 times your line bet. Also watch out for guitars and rum. Both of these symbols will also fetch a handsome price. Of course there is the music. Spin in as many musical note symbols as possible as these are scatter symbols. They will multiply your total bet for a chance at even more big money wins. Can you find the elusive singing parrots? Find out in this fantastic slots game. The musical note icon is a scatter. If you spin two or more anywhere on the board, it will multiply your total bet by 1, 5, 20, or 200 respectively. The treetop parrot hut is a wild symbol. It will replace most others (excludes scatters) to help you bring in more winning combinations. It will also trigger a bonus feature, but only appears on reels 2 and 4. 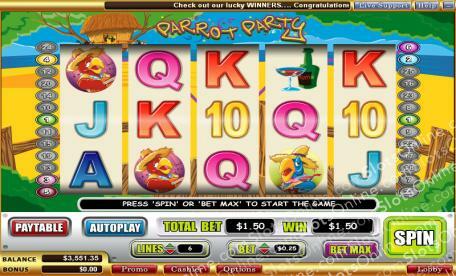 If you can spin the parrot hut on reels 2 and 4 at the same time you will trigger the bonus feature. During this game, you will select each hut to reveal your prize. Win up to 250 times your total bet.